Last weekend before heading to Tiesto, Vince and I stopped by McDonalds to grab a quick bite since we just got off work. We're healthy, I know. When I entered the fast-food chain, I saw a poster that immediately caught my eye. 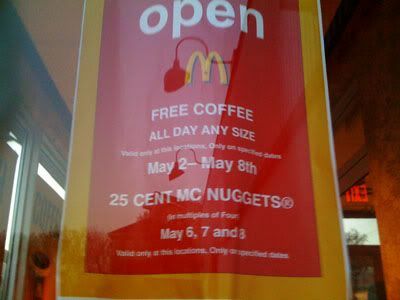 Chicken McNuggets, 25 cents each, all day long from May 6-8. Amazing. The memory came drifted back into my head this morning, and I was on a mission to get the nuggets after work! We arrived shortly after 9pm, and there was quite a long line. Only one line, with everyone lined up single file. I didn't think it would take long to get my order through, but the line wouldn't budge. There were maybe 10 people ahead of us, and slowly, more people trickled in and made the line even longer. It's times like these that I'm thankful for Twitter & Facebook, haha. We overheard some of the orders being put through, and finally understood why the line was hardly moving. 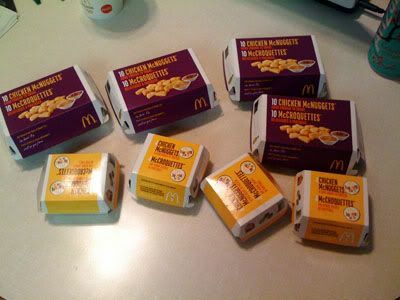 Some people were ordering 40, 60 and even 80 nuggets! My mind was blown. Of course, they were probably ordering for friends and what not, but I choose not to think of that, and just think they're mighty powerful for being able to digest so much chicken & batter. Kind of gross when you think about it. After waiting 30 minutes, it was our turn to order! Together we ordered a total of 56 nuggets. Holy cow. They were allowing purchases in units of 4, which is smart cause the staff wouldn't have to deal with odd numbers. I have to admit, I planned on being able to eat 16 of them by myself. Vince planned on 28, and the remaining 12 were for my parents. But whoo, after the 12th one I started feeling really greasy and sick. Now I know my nugget limit, and I don't plan on eating nuggets again for a VERY long time.